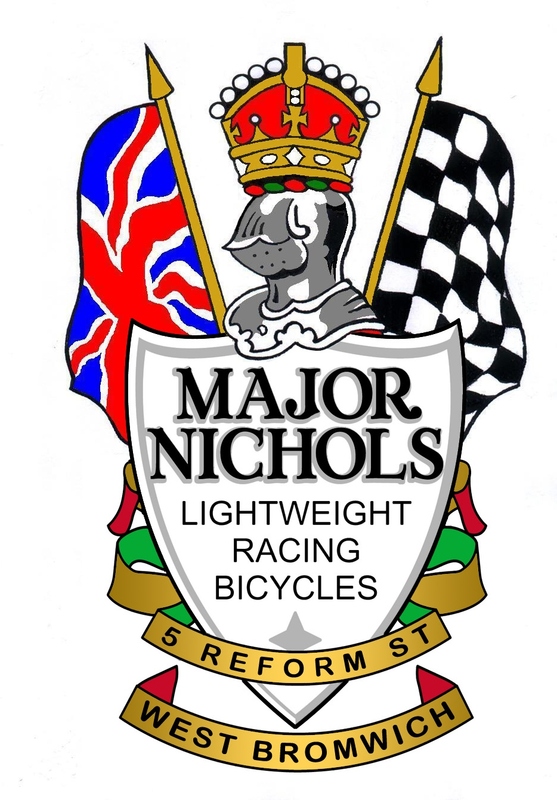 The significance of the Major Nichols Lightweight Racing Cycle to British cycling began to re-emerge about a decade ago with the work of the current Marque Enthusiast of the Veteran-Cycle Club (V-CC). His researches defined the life of a man who had built my first frame in 1958, a talented engineer who taught himself with help from another frame builder. He went on to face trials and tribulations in his life and yet continued to build an international reputation and produce a product as fine as any in Europe. Alvin Smith’s research gives a fine portrait of the irascible man I knew to be so good with us youngsters and of his life and times. Fortunately Alvin is working on a book about Major. Hopefully it will emerge into the world and fill in some of the gaps in our cycling heritage. He has given his tacit support to this site in the hope that it will bring out more information beyond his book and record elements of Major’s work in photos, words and steel before they are lost, forgotten or destroyed by thoughts that they have no value today. To date there has been no formal focus for Major’s work beyond Alvin who deserves some support and as one of his friends I hope that this website will fulfill the need. For those new to Major Nichols perhaps the best place to begin is with these articles by Alvin on the Black Country Society website here and on the Classic Lightweights website here. We hope the site will follow in the steps of those of Hetchins and The Flying Scot, but remember, Major’s production was far less than these other classics and so there are relatively few survivors. Owning a Major Nichols is to become part of a small group of enthusiasts and gives you an opportunity to add to our collective experience and social history. Please help us to continue to build a record of Major’s work and record reminiscences about his life and your Major Nichols experience. Alvin’s impending book about Major and his bikes will give a clearer picture of this talented engineer and craftsman. Your contributions will help to enrich the record beyond that. Every frame number that can be verified will be recorded. It may give some security to record your bike with us and help in possibly finding stolen frames. In parallel a photo record will be made to help in future, particularly for the V-CC’s Marque Expert. Any opinions on frames have a caveat. It may not be possible to positively confirm identity completely. Unscrupulous people exist who choose to change identities and produce copies. Our opinions are not proofs. We will, if you are seeking to buy, confirm the existence or otherwise of the frame number. With the written agreement of the owner we may also give information on previous history if we have access to it. There are also stolen items, a very small number of which we know about. We will normally be able to help identify frames he made and very occasionally, the model. This can include frames made for others including Wilsons and the 25 or so shops he built frames for or used as agents from frame numbers in the recorded years and from original finish details. Remember that once you refinish a frame and the original finish and transfers/decals are destroyed there are only the frame and the frame stamping to help. Unfortunately there were some strange untypical numbers or no letters and even no numbers at all, notably on very special frames. Good photos of the original finish and details may help but may not be enough to be conclusive without proper provenance. You can check a frame number with us or register your own. We are unable to share the full list as it is being added to and modified from the original record and contains confidential material. 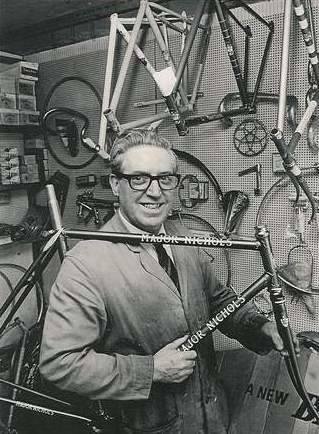 Alan lived in West Bromwich and raced as a junior with the Hill Top CC when Major was its President and his shop was at 5 Reform Street. Alan has been conspiring with Alvin for some time to help him with Major’s records from 1956 to 1970 and to pick up intelligence about existing MN bikes whatever age when he can. The post 1970 shop record was stolen when Major was robbed in Smethwick. Pre 1956 there is no known shop record. Alan is interested in hearing from former members of Hill Top CC. James is a keen cyclist and knows a bit about social media operation, deals with computer stuff and manages the site while Alan does the day to day administration and correspondence. Both ride Major Nichols bikes of course. We know there are others who knew Major far better than us and we hope they will help us out from time to time! We have also set up a closed Facebook group. At some point in the future we may set up a forum for discussion if desired. Please remember that if you are not in a Veteran-Cycle Club (V-CC) member, Alvin is not obliged to help. We will do what we can. We will not do valuations or act as agents but we do hope that in some cases that we can bring people and old pals together. The photos contained on this site may have been taken or supplied by the owners. Other photos may have been sourced from public domain and social media. If you feel that a photo does not meet that criteria or is copyright protected please feel free to contact us to discuss. Please contact us if you wish to use the photos and we will ensure the owners are happy to give permission. If you do use material we would appreciate appropriate credit. I am pleased to confirm that i have been the owner of the blue / bronze M N frame as pictured on your gallery for the past 3 to 4 years. I indeed bought it from Italy from a no doubt reputable seller /enthusiast I was living in Margate at the time but moved to Kidderminster 2 years ago. The frame is in exactly the same condition/state as the Ebay photos shown. The frame number is MN 6678 on the BB with additional stamp of C F fork tube 6678. Dropouts are plain stamped unthreaded mg eyes. I intend to keep the frame as original doing only minimal touch up work it will be built up and running very soon and I hope I can join your happy band. my interest in M N and classic bikes is a long story, so i might write to you when my wife stops sedating me! Kindest Regards David Biking mad!